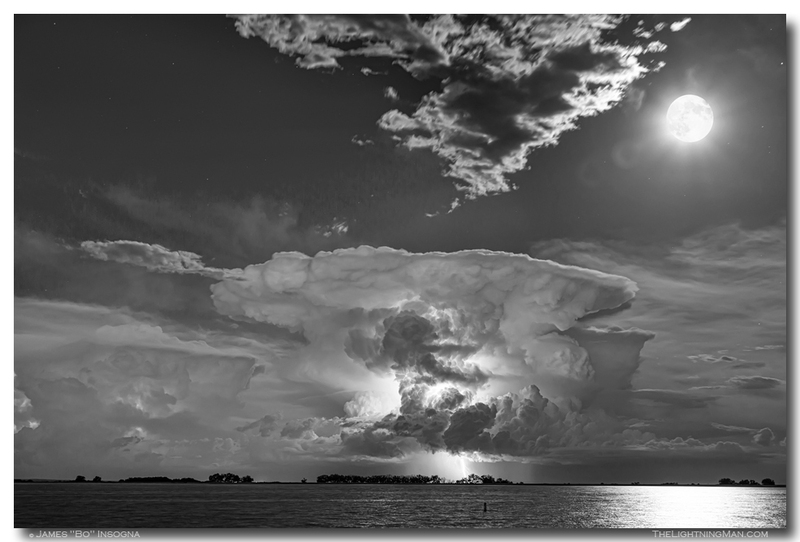 Isolated mushroom thunderstorm cell with cloud to ground lightning striking and a full moon above in black and white. 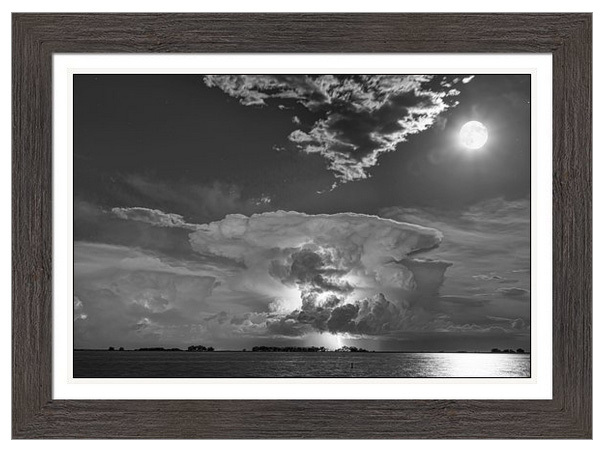 Mushroom Thunderstorm Cell Explosion and Full Moon BW framed print by James BO Insogna. Ships within 3 – 4 business days and arrives ready-to-hang with pre-attached hanging wire, mounting hooks, and nails. Choose from multiple print sizes, papers, mats, and frames. Mushroom Thunderstorm Cell Explosion and Full Moon BW metal art prints by James BO Insogna. Ships within 3 – 4 business days and arrives ready-to-hang with pre-attached hanging wire, mounting hooks, and nails. Multiple sizes available. Your Art gets printed directly onto a sheet of 1/16″ thick aluminum. The high gloss of the aluminum sheet complements the rich colors of the fine art to produce stunning results. Mushroom Thunderstorm Cell Explosion and Full Moon BW canvas art prints by James BO Insogna printed on premium canvas and stretched on 1.5″ x 1.5″ stretcher bars (gallery wrap) or 5/8″ x 5/8″ stretcher bars (museum wrap). Ships within 3 – 4 business days and arrives ready-to-hang with pre-attached hanging wire, mounting hooks, and nails. Choose from multiple print sizes, border colors, canvas materials, and frames. 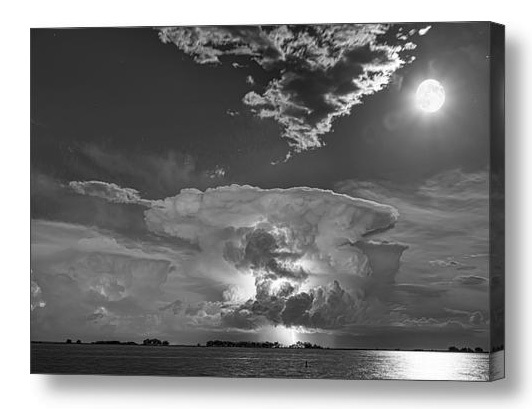 Mushroom Thunderstorm Cell Explosion and Full Moon BW acrylic art prints by James BO Insogna. Ships within 3 – 4 business days and arrives ready-to-hang with all mounting hardware included. Choose from multiple sizes and two different mounting options (metal posts / hanging wire). Great for your home decor, office walls, boardroom, waiting room or any commercial space. Your fine art image pick gets printed directly onto the back of a 1/4″ thick sheet of clear acrylic. The high gloss of the acrylic sheet complements the rich colors of the art to produce stunning results. There are two different ways to mount your acrylic fine art print. Option #2 (Hanging Wire) – With this option, your acrylic print is attached to a 1/4″ thick black board which has a wooden frame and hanging wire attached to the back. There are no metal mounting posts at the corners. Simply put a nail in your wall, hang your print from the hanging wire, and you’re done. Colorado black and white monochrome fine art nature landscape lightning weather photography poster prints, ready to hang decorative canvas prints, acrylic prints, metal prints, corporate artwork, greeting cards and stock images by James Bo Insogna (C) – All Rights Reserved.